He’s Learned How To Order Soup, Too. Though Jim is really fond of educational television like the History and Discovery Channels, I prefer to watch shows that are on the entertaining side, like sitcoms or reality tv. Not that you can’t learn anything from those; how many times have you ever quoted from “The Brady Bunch” (“Mom always said not to play ball in the house!”) or other shows that provided you with advice on a wide range of topics? Apparently, learning from sitcoms runs in my family. My boys are not fashionistas, to say the least. Generally they could care less what they wear. Well, they have opinions about their wardrobe but not really strong ones. I don’t recall ever fighting with them about clothing. Basically if they are not with me when I buy them clothes, I ask them to tell me honestly if they will wear the items or not before they take off the labels, and if they don’t think they’ll wear the clothes, I’ll take them back for a refund. Luckily, I am pretty good at knowing what they like. Where we have hit a rough patch? They don’t always tell me when clothing items are getting too small (or, I guess the boys are getting TOO BIG). As I have folded laundry over the past few months, I have noticed the size of the 13-year-old’s underwear in relation to his size and thought, “How is he even fitting in these?” I bought him some new, bigger boxers a couple of months ago and he’s using them, but still wearing the old ones. Finally, the other day I had enough. I saw those little baby boxers (not really baby boxers, but they are S-M-A-L-L!!!) and called the boys to the family room. I just lost my coffee reading that! It’s only a matter of time before he says he’s going to drive a truck full of cans to get recycled, or when he starts answering his cell like the moviefone guy! Oh, this is too funny! Love it! Well, thank goodness we have Kramer to teach us of such things! Oh my gosh! I may start making my son homemade underwear made out of rubber-bands from now on. Thanks for the tip! Isn’t that the way? 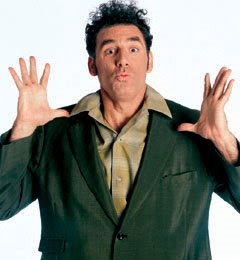 They couldn’t take life lessons from Mr. Roberts, has to be Kramer! You need to put a camera in your house and set up a live feed. You’re family is priceless! I’m glad the 13 year old is going to get new undies. 🙂 That’s gotta hurt for a boy. Sooo funny. I guess it’s true you can’t underestimate the educational power of television. lol! Kathy: I LOVE porkchops and applesauce, sweethaaart! Mags: A live feed, huh? I can only imagine the hilarity that would ensue! But my kids would be mortified. (Not that I would really consider it, but as I thought in my head how that would go over, I could see them burying their heads in the sand.) Great idea though! I think I’ll stick to watching reality tv! Stacey: Yep, you never know what you’re going to pick up! I would definitely take advice from a Seinfeld episode! What am I saying, would? I have taken advice from Seinfeld. Smart boy you have! Buy that boy a Manssiere! That was so funny I had to read it out loud to Bryan! Hahaha! I won’t laugh too hard, it’ll be me in 12 (good GRIEF I’m OLD) years. Next post: We’re Taking Over. Previous post: And I Don’t Even Work In An Office.